For Lion, the challenges of the industry drive the need for a diverse talent search. “The key to tackling a complex regulatory industry like environmental compliance is to bring in a wide variety of backgrounds and experience." Thousands of waste deliveries over almost a decade have resulted in a 75-foot pile of dirt, plastic, rebar, concrete, piping, asphalt, and other debris in Vernon Township, NJ. Township residents allege that this dumping operation resulted in water contamination to neighboring wells. To ensure human resources professionals have the skills to provide a positive, safe workplace, Lion Technology has launched their new Human Resources online training courses. The updates in PHMSA’s IFR may look familiar to lithium battery shippers—these three new requirements were added to the ICAO Technical Instructions and the IATA Dangerous Goods Regulations as “emergency revisions” in 2016. EPA's February 2019 update to the TSCA inventory shows that 86,228 total chemicals make up the current TSCA inventory. Of those, 40,655 chemical substances are active in commerce. On Valentine’s Day 2019, US DOT announced a forthcoming Final Rule to require railroads to develop and submit Comprehensive Oil Spill Response Plans (COSRPs) for routes traveled by High Hazard Flammable Trains. On February 22, US EPA published a Final Rule to make major updates to the required management standards for hazardous waste pharmaceuticals. 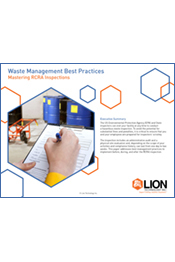 From legal exposure to liability to making money by recycling, instructor Rosie Bottone provides some guidance on how to make a business case for effective RCRA hazardous waste management.